Spent is that rare entity — a book that really may “change your life.” This is one of the most sensible health and wellness guidebooks to come along in years. Every tip and suggestion in Spent is worth embracing, but if you did even a portion of the program you’d no doubt feel better and have more energy. The title alone tells you that the author is approaching medicine and his patients with some creativity — Spent is Lipman’s name for the cluster of symptoms that include fatigue, aches and pains, anxiety, stress, insomnia, digestive problems, and more — as he calls it, the “epidemic of exhaustion” that patients are increasingly presenting with and for which modern medicine has so few remedies. Don’t relate to any of the symptoms yet? Throw in back pain, distractibility, fuzzy thinking, the feeling that you’re aging too fast, or some of the “depression” pathology, and the odds are good that most fast-tracking Americans are suffering from one or more of these complaints. Lipman, after years of studying these symptoms, came to the conclusion that modern people are out of rhythm with nature and their bodies and, in effect, are depleting their “bank of energy” trying to cope with the stresses of their environment. 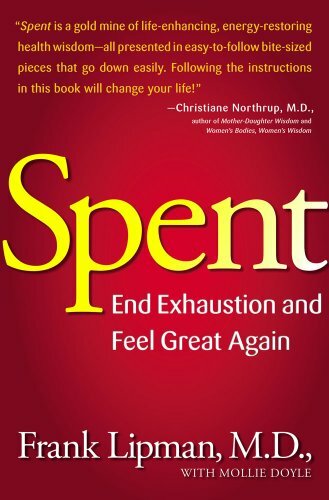 With Spent, the author combines his medical training and additional years of working with Chinese medicine and a variety of alternative practices to offer up the best ways to reverse this problem. There is a wealth of information and common sense guidance in these pages. Dr. Frank Lipman is the founder and director of the Eleven Eleven Wellness Center in New York City.In addition to Dr. Lipman's training as a traditional Western Medical Doctor, he has been blessed to have studied with “Masters” in different fields, including Yoga and Meditation, Mind Body Medicine, Chinese Medicine, Functional Medicine, Nutrition, Exercise and Bodywork. He has put all this knowledge and an understanding of health to practical use in the way he has cared for his patients in the last 30 years of being a Doctor.